I've shown this setup before but I think it's worth a rerun. 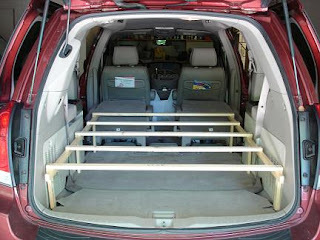 This is the rack J made to my specifications a couple of years ago for our Nissan Quest. With the backs of the middle seats in flat position, they are the same height as the rack. I can take an 80"x 48" painting on the top shelf if necessary. Usually my work doesn't exceed 72" but nice to know it could. I was at this point in packing when I discovered what could have become a most embarrassing situation! Propped in the glare of sidelight, I could easily see where I had made last minute corrections on this painting, see the dull spots in several places? So, back down to the studio with the pair (taking no chances) of them and a quick final coat of GAC 500 on both. Back up to pack the rest, planning for space on top for the latecomers. Although dry to the touch, it takes at least 24 hrs to really harden so wanted to be sure they are face up for the trip. Finally, all eighteen are loaded and ready to go. 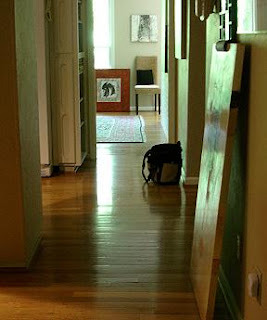 I'll do a solo run to Memphis tomorrow, leaving as early as I can get away to skip out ahead of commuter traffic. Three audio books will keep me entertained (surely ONE of them will!) for the turn-around trip... four hours each way! I can do this! 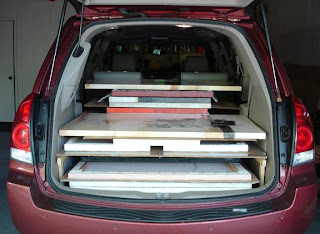 This might seem an odd comment--but this little story of your car, your packing, the recalcitrant paintings, your round trip, and you courage is inspiring. YOU are an inspiration, always. Fabulous, Karen.